For people who are considering to purchase a new premium Android 2.3 Gingerbread-powered smartphone with competitive specifications, the Samsung Galaxy S II and HTC Sensation smartphones might in your consideration lists, as both models deliver a powerful 1.2GHz dual-core processing power. 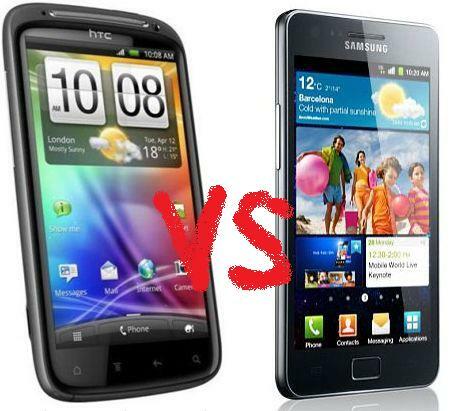 If you would like to know more details of this two high-performance smartphones, here’s a comparative table of Samsung Galaxy S II vs HTC Sensation which list side-by-side the features and specs comparison at a quick glance. From the table above, you can found that both of the contenders’ specifications are slightly similar, with the slimmer Galaxy S II features lighter body, larger RAM and more powerful battery than HTC Sensation – sounds like Samsung Galaxy S II is the winner for this battle, although HTC Sensation is noticeably higher screen resolution. What do you think for the rivalry?